Here's a great email I received the other day. This is one man's way of doing the diode fix that is definately right in line with the way most things go around my workshop. Use what I can find in the workshop, or what I can find locally. Thanks for the info Steve. Taking a cue from your excellent article, I decided to go with the "full size" components. Of course, the first problem is that Radio Shack does not stock 30K resistors, much less the 1% variety. They do, however, have a 1% Metal-Film resistor assortment (Part# 271-309A - $2.29) which contains 50 "assorted" resistors - but this assortment is an itemized collection guaranteed to contain, among other things, two 15K 1% resistors (for anyone who's wondering, combining them does not make 30K at 2%, it's still 1%). The two you need are coded brown/green/black/red/brown. Problem two is that the Shack does not carry 3300pF ceramics caps, but, here I simply substituted a 4700pF (.0047uF) ceramic cap which they do sell (Part #272-130 -- $0.59 and you get two of them). The logic here is that while the resistor may be critical, the capacitor in the circuit, which goes from the analog signal to the analog ground, is simply there to filter out hi-frequency noise (I verified this from WinBond's data sheet). Unless you were attempting to make hundreds or thousands of readings per second from the CPU diode, a slightly larger value here is very unlikely to have any adverse effect. My modifications appear to be working fine. I have attached two photos of exactly how I have accomplished these mods. If you would like to use any of the suggestions contained in this letter, or use the one or both of the photos for your Web page (perhaps as an update addendum to the Diode Fix article), I encourage you to do so (indeed, I'd be flattered-). I also have higher resolution versions of the photos if you require them. Regards, and keep up the great work! apart (again! ), since removal of the MB is required to read it -- I'm not quite up for doing that for the third time today! I'll let you know if I find out. I wrote Steve that I thought that adding a piece of heat shrink tubing to the loose ends of the resistors would be a good idea to prevent a possible short. His response was that he had thought of the same thing and it was already in place. 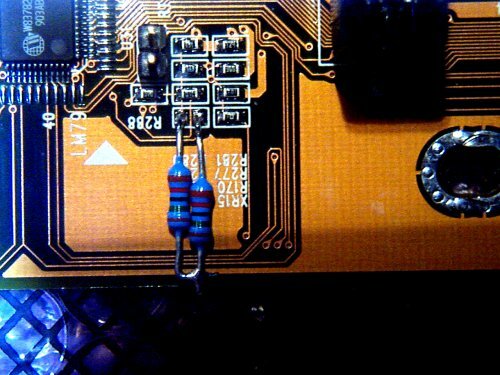 He has also shortened the resistor leads to keep the resistor from being too close to the edge of the motherboard. By the way, the count of people responding to which revision of the BX6r2 has reached over 100 and so far all of the revision 2.01 except 1 have had the capacitor and resistor installed by Abit, while all of the revision 2.02 have had none. 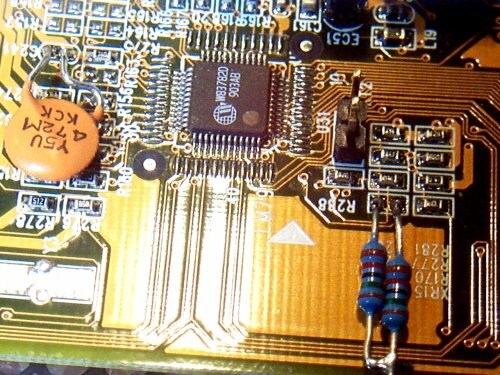 From what I have heard, there are no plans to add the capacitor and resistor back to the board.